As of this year, I have made the decision to stop infilling work from other salons. I wanted to make it clear to our future clients why we now kindly decline to refill others' work, as I don’t want it to come across as snobbery or a scheme to milk money from potential clients – it couldn’t be further from the truth. 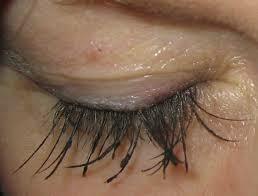 There are many talented lash specialists out there who create beautiful, clean sets of lashes. Unfortunately, there are just as many careless technicians who have no regard for their client’s lash health and take no pride in their work. From past experience, majority of the times that a client has come from another salon, it has been less than satisfactory work that I’ve had problems infilling. When a client with an existing set from elsewhere books in for a 60 minute infill with me, I have no idea what their lashes look like until the day of the appointment. When the set turns out to be like one of the cases shown above, I simply cannot infill that work. Oftentimes, I cannot even get my lash brush or tweezers through them. One hour is also not enough time to completely remove and re-apply a new full set. As a solely run business, my availability is limited and I cannot afford to book out a few hours in anticipation of a bad job each time either. I hate to turn away clients or have them leaving without the fluffy full set of lashes they were expecting. Hence, these factors have lead me to kindly decline infilling the work of others and offering my infills exclusively to Tokyo Lashes customers. Having said that, if you have had damaging, poorly applied eyelash extensions from another salon, we are more than happy to look after you! Please book in for a removal and your choice of a new set via www.tokyolashes.fullslate.com. As a Tokyo Lashes customer, you can expect consistent results each time using the best supplies, from a specialist that takes pride in her work and cares for your natural lashes.